Each unit’s unique design allows it be to be used for tabletop, wall mount, therapy cart or mobile use. Its lightweight design, battery-powered option and custom carrying bag allow you to conveniently take the clinic out of the clinic. •Fully functional 1 and 3.3 MHz frequencies. •Two channels of electrical stimulation output. •Ten user-defined memory positions for User Protocols. •Four standard waveforms on board: Interferential, Premodulated, Russian and High Volt. 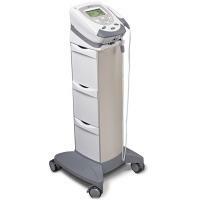 •Pulsed and continuous therapy operation(10%, 20%, 50% and 100%). •Independent intensity and parameter controls for each channel. •Ergonomically designed sound head applicators in a variety of sizes (1 cm², 2 cm², 5 cm² and 10 cm²). •All sound head applicators are interchangeable due to Electronic Signature residing on all transducers. •Soundheads are watertight for use in underwater therapy. •Head warming feature on all sound head applicators. •Unit uniquely designed for tabletop, wall mount, therapy cart or mobile use. •110V or battery powered option. TENS/EMS Units & Stimulators can be found in our extensive online collection of products from globally recognized and trusted brands, including Chattanooga. An excellent option to consider is the Intelect Transport Combo.